Glass Rack offered to find wide usage in the market including use in the display of products like mobiles, glassware, decorative items, consumer goods, and other similar products. 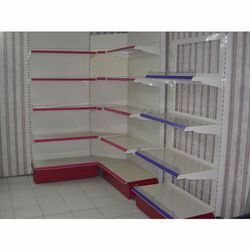 These shelving solutions can be made available by us in different sizes and design options as per the specific needs and demands of the customers. With the racks known their superior finish quality and durable finish, these can be also ensure stored items are free from dust as well as assist in adding elegance to the displayed items. Backed by a proficient team, we have been able to provide quality Gondola Glass Rack, which has an open design that contributes to optimal cleaning results. These racks absolutely match to the height and diameter of the glasses ensuring maximum safety for the glasses. 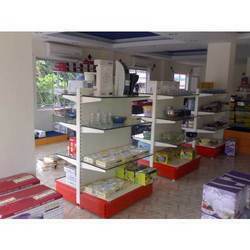 We have established ourselves as a leading manufacturer of Glass Side Rack. The offered product is manufactured using quality raw material thus ensuring optimum load bearing capacity and durability. Looking for Glass Racks ?